CD #1. From Anxiety to Comfort brings patients comfort and relief from the anxiety and fears which come with testing, diagnosis and treatments. CD #2. Infusion Ease is designed to soothe patients as they listen during infusion. The hypnotic messages include suggestions for few or no side-effects. CD #3. Restoring Health should be used while under treatment and at home between treatments. The message suggests restoration to health and living well. CD#4. Living With Cancer: Self Care and Comfort is for those who are being treated or expect to be treated long term and those whose disease has returned. It is designed to bring you comfort, joy and peace. CD#5. Less Pain teaches you self-hypnotic techniques that decrease the sensation of pain. You will probably need less pain medication giving you the potential of a clearer head and a greater ability to function. 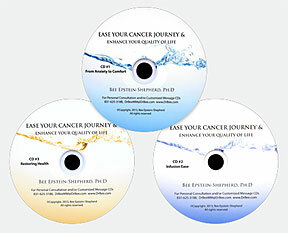 The generic CD's deal with issues common to all cancer patients. However, each patient has his or her unique issues and concerns. I can customize CD's that focus on the individual issues such as inability to sleep, hot flashes or other discomforts, fears ego issues and more. Stress First-Aid for the Caregiver. As you care for your special person, it’s vital that you care for yourself too. Research shows that caregivers suffer from stress to the extent that their own health and well-being is impacted. This self-hypnosis CD gives you suggestions for stress reduction and most important, provides you with 20 minutes of complete physical and mental relaxation which restores and rejuvenates you. Stress First Aid for Nurses and Health Care Professionals brings relaxation and respite to those whose every day activities support the health and well being of others while depleting their own energy. Also available Surgery Ease: This eliminates the pre-surgery anxiety, promotes faster healing with fewer side-effects. 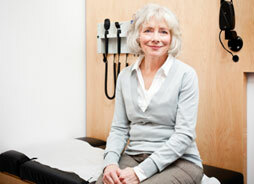 The diagnosis of cancer can send you into a tailspin of stress and fear. Decisions regarding the best course of action and treatments can be daunting. The actual treatment can result in unpleasant side-effects, low energy, insomnia, fatigue and pain. Hypnosis helps lower anxiety levels and creates the clear thinking useful in making decision. Research done by Carl and Stephanie Simonton in the 1970s showed that those patients who using mental imagery (which is basically hypnosis without the hypnotic induction) had a better survival rate than those patients treated with chemotherapy and radiation only. In addition, the quality of life for those using mental techniques was better. The goal of hypnotherapy is to bring freedom from anxiety, stress and pain, eliminate the unpleasant side effects of chemotherapy, radiation and surgery and to maximize the quality of life. As a specialist in medical hypnotherapy, I have provided complementary care to many cancer patients. All have experienced relief from their anxiety and physical symptoms. There is even some anecdotal evidence that hypnotherapy can cause tumor shrinkage. Call 831-625-3188 for a free phone consultation to discuss how hypnosis can contribute to your life. * I will make sure your oncologist and other health care providers know that you have chosen to explore hypnotherapy as a complement to their treatments. I will become part of your team. * At our first appointment you and I will have a conversation regarding your concerns and discomforts and I will explain how hypnotherapy can benefit you. * I will introduce you to the comfortable comforting hypnotic state, then hypnotize you to bring you the relief you want. I will record a personalized hypnotic CD so you can recreate the comfortable experience and reinforce the benefits at home. * At a later appointment I will teach you self-hypnotic techniques so you can use these techniques whenever you feel discomfort or want a greater sense of well being. I am committed to “do no harm.” As long as you are seen by a trained experienced and reputable hypnotherapist you should experience only benefits. Stay away from anyone who uses hypnosis as entertainment or those with little medical hypnotherapy training and experience. I have worked with clients for as short a time as one hour. This was to eliminate the stress and anxiety over impending mastectomies. Some people prefer to work with me in person more often rather than reinforce with the recorded CD’s. These clients may come in 6 to 8 times. The average number of sessions is four. I will make recommendations and give you choices, always respecting your preferences. I am sorry, I cannot take insurance, but for cancer clients only, I have a sliding fee scale to make hypnotic relief accessible to those who need it most. What can I expect from my hypnotic experience with you? You can expect to be treated as a unique individual and with respect. Your specific concerns will be thoughtfully addressed. You can expect to feel relaxed, rejuvenated, encouraged, and to find some relief from your physical and emotional discomfort. Ultimately, you can expect to feel better. I wanted to let you know how much you helped me through my cancer journey. I have completed radiation, chemo and stem cell transplant and triumphantly state I am now in remission. Thanks to you I experienced all these issues without any pain medication. My doctors and attending staff were quite impressed. The visualization and self-hypnosis you taught me was my comfort and strength. That was all I needed to get me through some tough events. … As I looked around at the other cancer patients in various stages of treatment, most were not fairing so well, even with the medications. I felt so privileged to have been your patient. I wish there were some way that everyone who was approaching medical procedures could have the benefit of your therapy. Again, thank you very much. I have had a needle phobia since I was five years old. When I began chemotherapy, it got so bad I would vomit and pass out at the thought or sight of needles. People who have been providing my medical care say that what you did with hypnosis was a miracle. I am so much calmer and at peace in every way. Working with you has changed my life. There is no way I can thank you enough, I will always be grateful. Every cancer patient should have the benefit of your work. 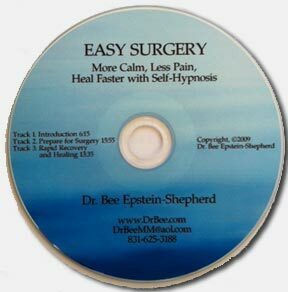 "Your hypnosis CD was helpful to me because it enabled me to feel more calm and more in control of my emotions prior to surgery. Furthermore it helped me feel I as an active player in my own health concerns. And finally, according to the surgeon, the cyst appeared smaller than previously noted. Thank you so much for what you did for my wife. After listening to the CD you recorded for her she was able to face her double mastectomy with far less anxiety. I have to tell you that after our session was the first time I did not dread and have anxiety attacks before going to San Francisco for chemotherapy. You really relieved my suffering. The CD that you did for me was extremely helpful in my healing Yesterday I was told that I will need no more treatment after I get my implants. Yea! My wife and I are so grateful for what you did for our little boy during the last days of his life. As we listened to your soothing message to him, it gave comfort to us as well.